The Bazaar is one of our favorite restaurants in LA, and I try to visit occasionally when I’m in town. I’m always curious to see what new dishes appear on the menu, but we always make sure to order a few of our old favorites. We were pleased to learn that they now have some daily specials. We ordered a few (the “Secreto”, tomahawk steak, and black truffle tortilla de patatas) and also ordered some of our old favorites (and a few new things). The food here is generally consistently good, and it’s kind of amazing that they can produce such a wide variety of delicious dishes. If you haven’t been here, you should definitely check it out! Jicama wraps with mint, basil, pickled ginger, cucumbers, and peanuts. Served with coconut dressing. 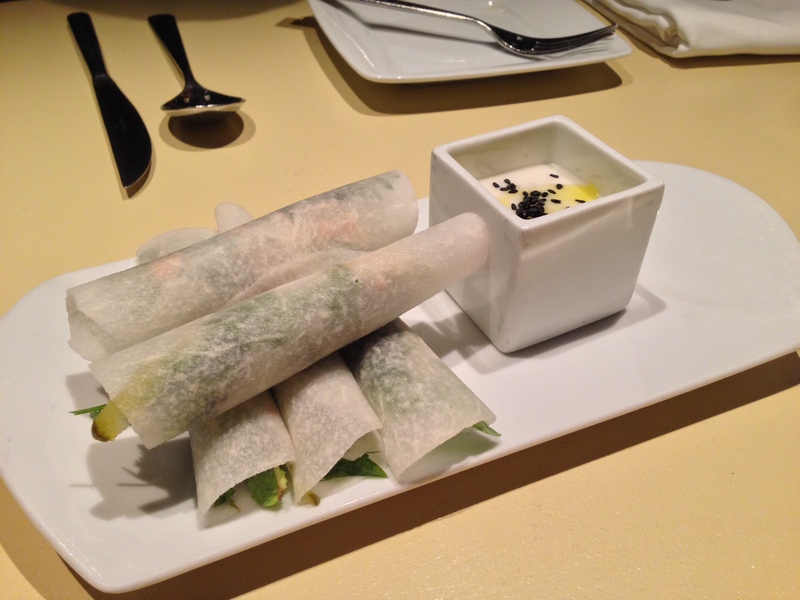 Simon: Very fresh flavors, well balanced, and reminds me of Vietnamese cuisine. I actually preferred the wraps without the dip. 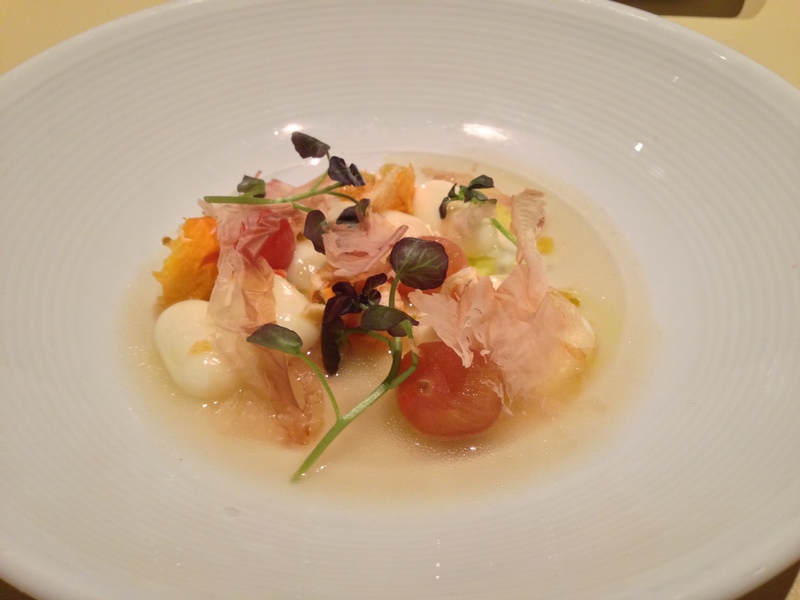 Yukon potato “gnocchi” with Idizábal cheese, Jamón Ibérico, dashi, and tomato. Simon: The “gnocchi” captured the flavor of gnocchi. It’s a shame that the pillowey texture was missing here, as that’s my favorite part of gnocchi. It was neat that jamón was used to simulate katsuobushi. 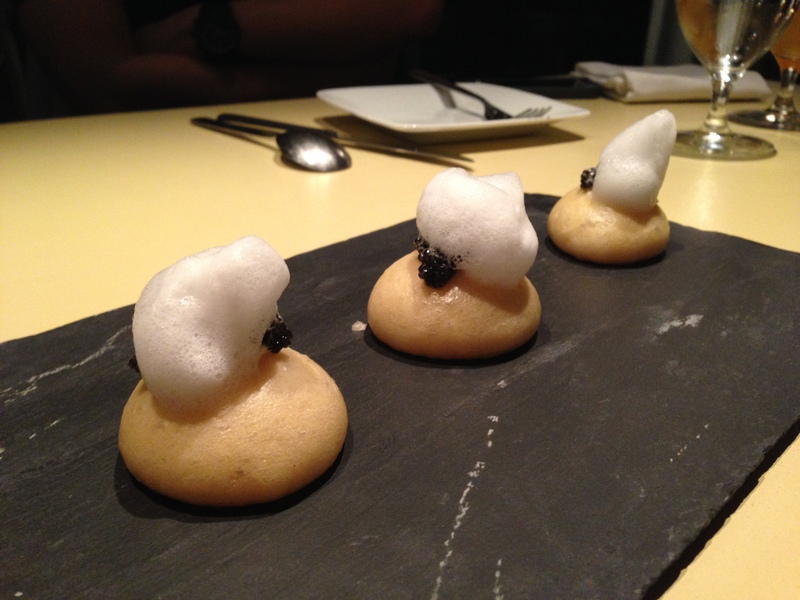 Steamed buns with American sturgeon caviar, crème fraîche, and lemon air. Simon: Taken as a bite, the lemon air hits first with a sour-almost-bitter flavor, but it just gets better from there. The buns were the highlight here, with a nice sweetness. I felt there wasn’t enough caviar here though, especially given the amount of buns and the strength of the lemon air. Lemon artichokes with black olive tapenade and dandelion. 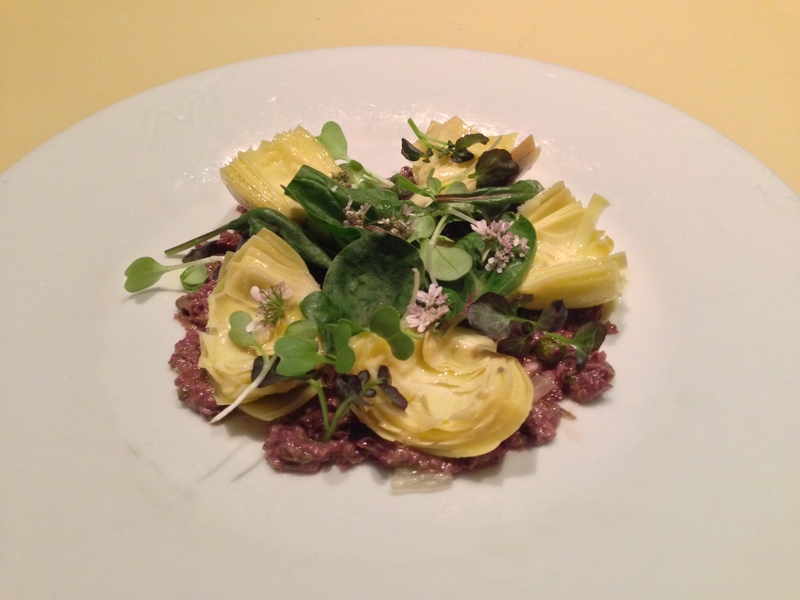 Victor: The artichokes were good and balanced well with the other ingredients, but this dish was forgettable. It was decent, but it paled in comparison to the others. Order it if you really, really like artichokes, I guess! 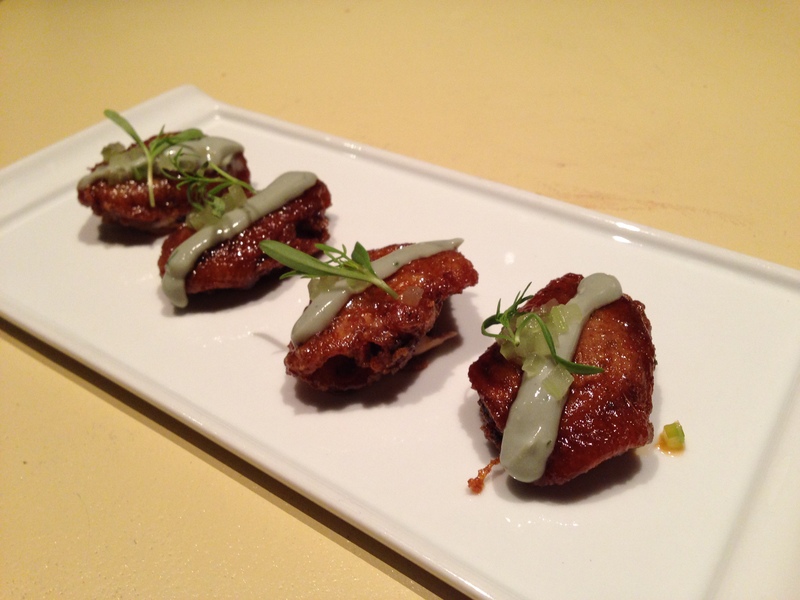 Eggplant tempura with local honey and buttermilk. Simon: One of the surprise highlights for me. 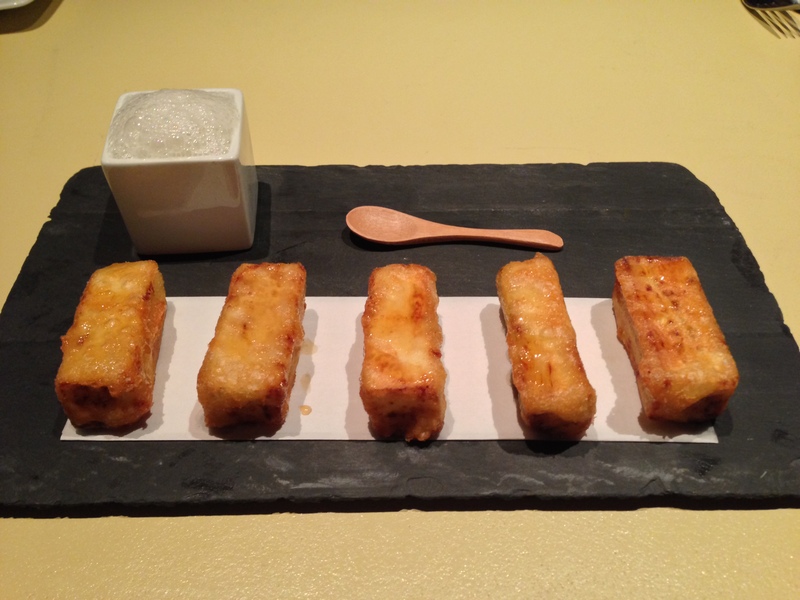 The tempura have a very nice honey glaze on the surface, while still retaining a light crunch. The texture inside was lighter than I expected of eggplant. I liked it better without the air/foam since it seems to dull the crispy skin. Victor: This was AMAZING. It was like a donut that had a hint of eggplant. Ohmygod I have to have it again when I come back. Boneless Mary’s Farm buffalo chicken wings with bleu cheese and celery. Simon: I felt the mushy texture of the meat couldn’t stand up to the strong buffalo and bleu cheese flavors. Victor: This was underwhelming :(. The meat’s flavor also wasn’t powerful enough to balance or offset the others. Simon: I’m very glad we got this. It reminded me of chicken pot pie. Victor: The chicken on the inside was a weird but very delicious middle-ground between liquid and solid. It was creamy, but it also had a “meaty” texture to it that made eating this even more enjoyable. 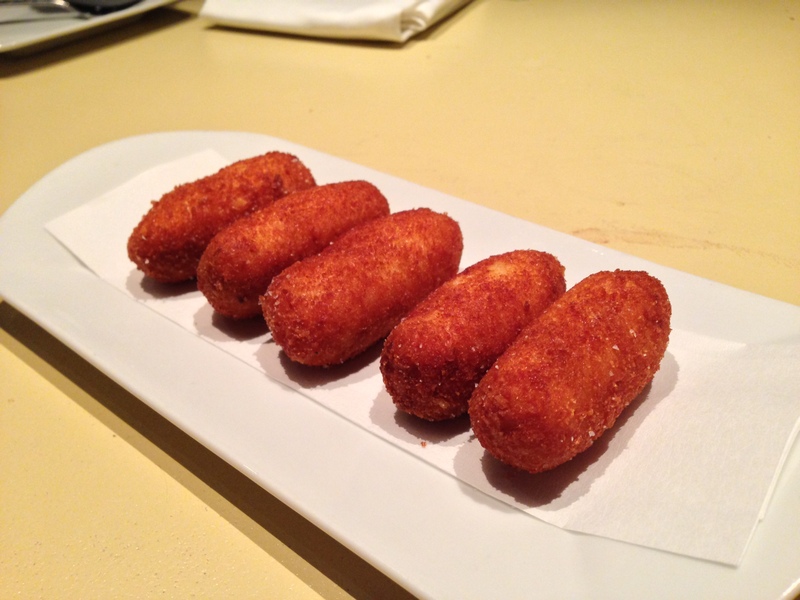 I’d definitely order this chicken croquette again. Jamón Ibérico de bellota with pan con tomate. 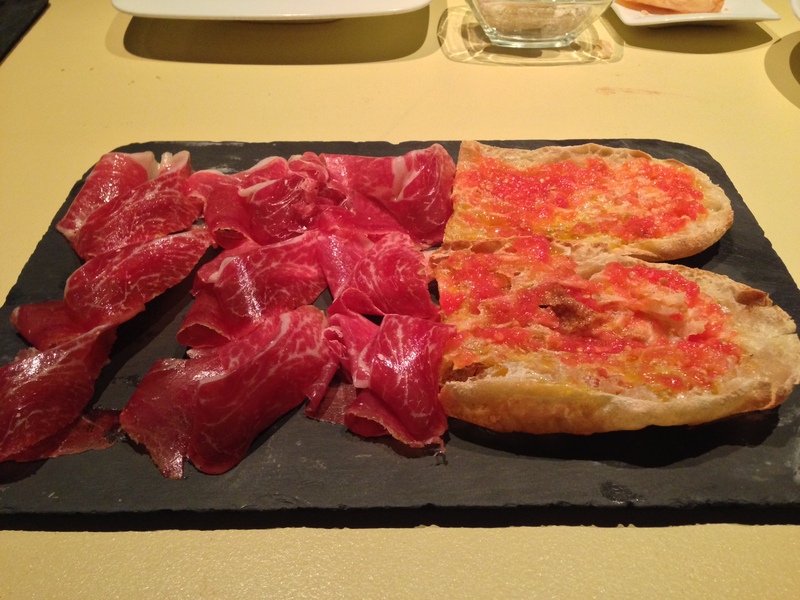 Simon: Can’t go wrong with either the jamón or the pan con tomate. It will always be one of the highlights of a meal. Victor: Ditto. You can’t go wrong with either. 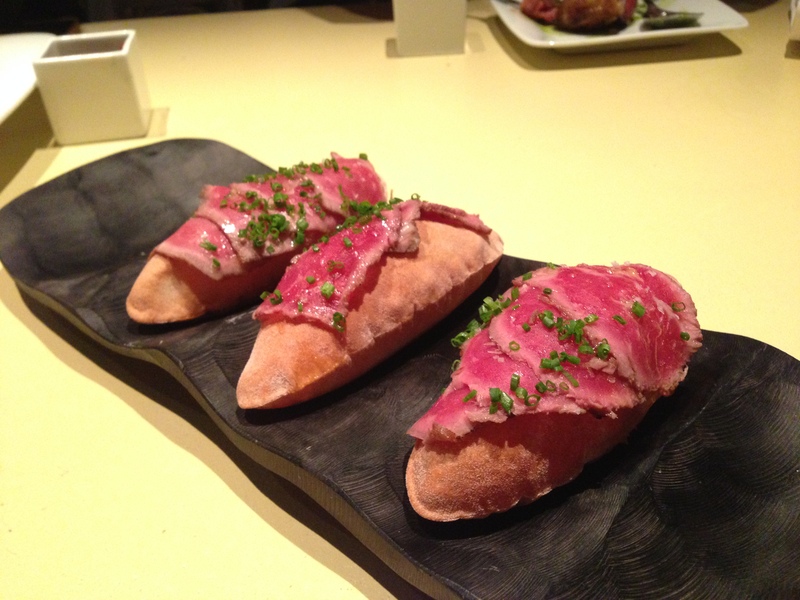 “Secreto” Ibérico de bellota with papas canaries (salt-wrinkled potatoes) and pan con tomate. 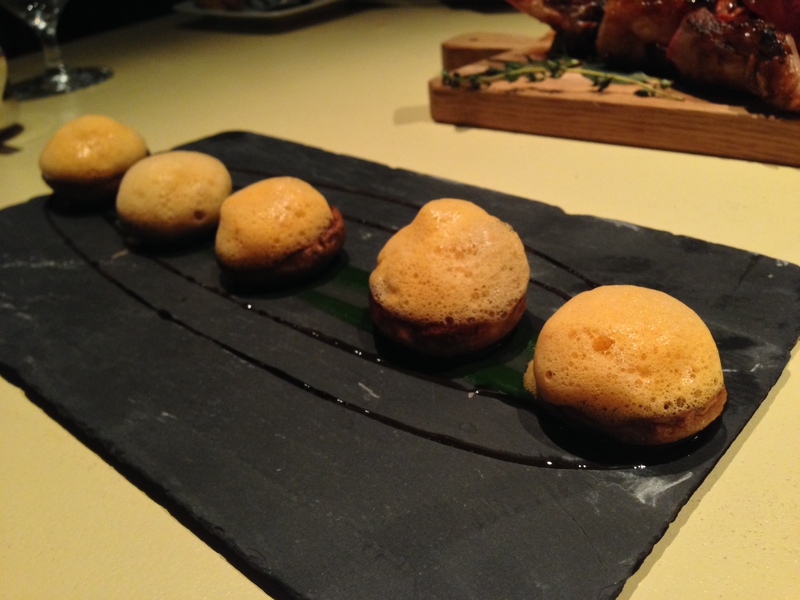 Simon: The secreto was very flavorful, and reminded me of taiwanese pork chops. The papas canaries were a pleasant surprise. They weren’t dense like typical potatoes. The pan con tomato was great, as always. 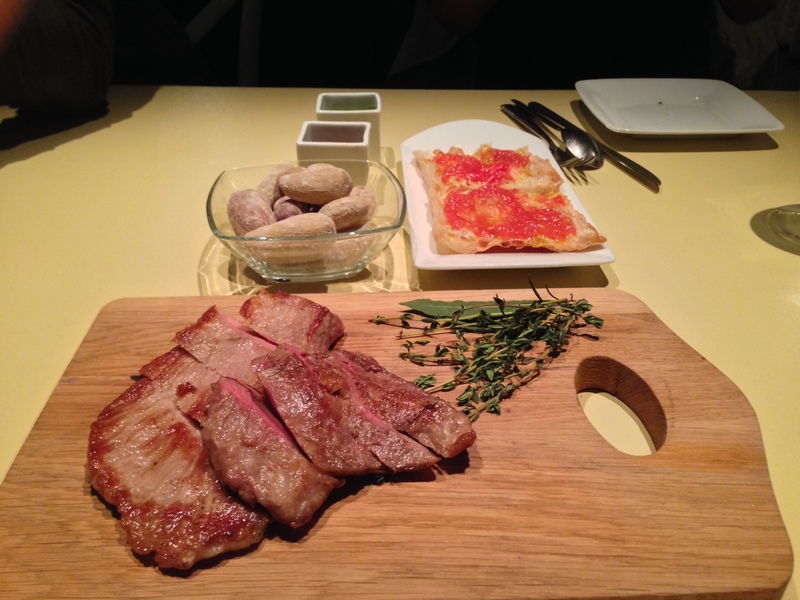 Victor: The “secreto” is a cut of the Iberian pig that most people never see. When you do, though, make sure you order it. It’s intensely flavorful. Also, MORE PAN CON TOMATE! Yay! 28 oz. 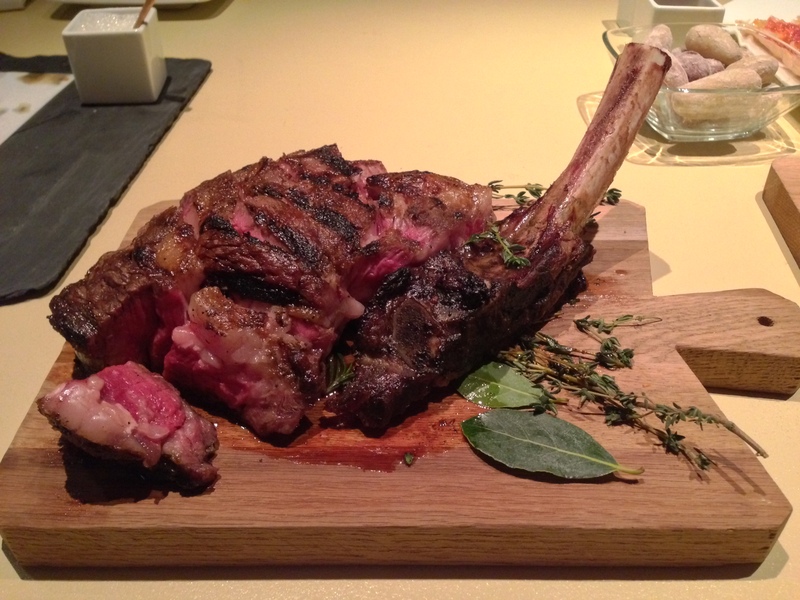 grass-fed tomahawk steak. Simon: Can’t go wrong with a good steak cooked properly. Victor: This was really good, but it honestly probably wasn’t special or different from other extremely good steaks you’ve had. Crimini/button mushroom caps stuffed with mushroom duxelle (mushroom, shallot, and braised mushroom stock) and topped with parsley purée and mushroom air. Victor: This was one of the few dishes that we didn’t finish. We expected the mushroom flavor to be more concentrated, but it wasn’t strong at all. Everything tasted kind of… dull. Sautéed cauliflower “couscous” with cauliflower purée, harissa, lemon, and quinoa. 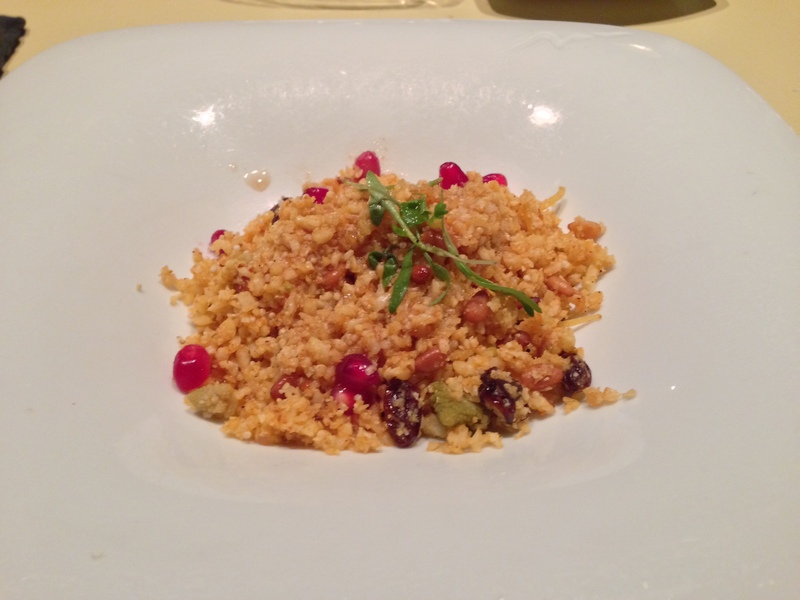 Simon: Very well balanced flavors, and reminded me of the cauliflower at Playground. Victor: As Simon said, the flavors were really well balanced. Nothing was too noisy, and everything was delicious. This was a welcome change from all the meat we had just had haha. 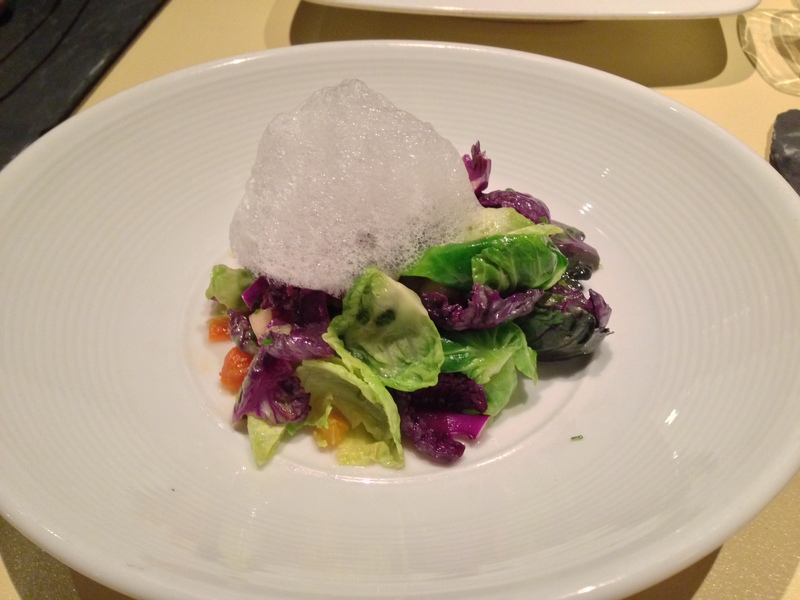 Brussels sprouts with lemon purée, apricots, grapes, and lemon air. Simon: I think this is the first time I’ve had brussels sprouts taken apart in this form. Victor: José Andrés does a really good job of adding acidity to dishes to prevent you from feeling too full, and this was a shining example. The brussels sprouts are delicious, but the lemon purée, apricots, grapes, and lemon air help make this dish refreshing and, in a way, “cleansing” (especially considering we had just eating a bunch of pork and beef!). This was a great dish that helped us prepare for the next onslaught of meat. Black truffle, potato foam, and 63C egg. Victor: They serve this without black truffle shavings, but this version with black truffles (it was a daily special) is even better. 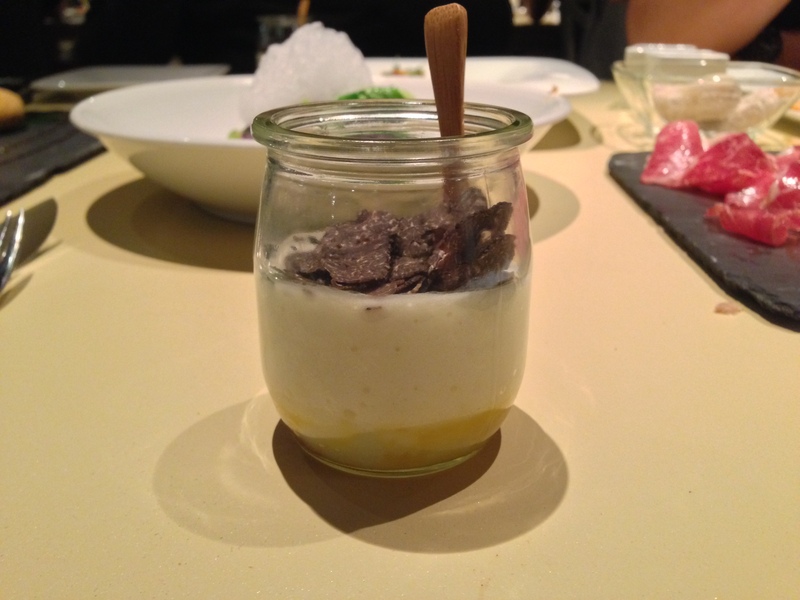 Black truffle and potato foam is really reminiscent of the “hot potato, cold potato” dish that Grant Achatz is famous for at Alinea. It was rich and decadent—but not overwhelmingly so. The small portion probably helped with that. Air bread with cheddar and Wagyu. Simon: Another standard favorite. The rich gooey cheese on the inside is always great. Victor: This is always one of the things I look most forward to when eating here. The cheddar cheese combined with the Wagyu and the thin bread never fails to result in a few seconds of gastronomic ecstasy. 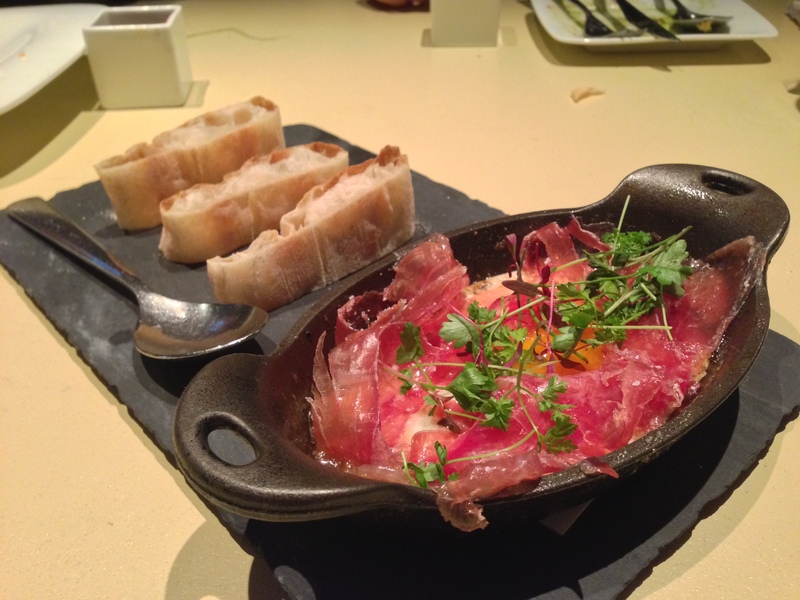 Jamón Ibérico with a fried farm egg and truffle butter. Victor: This was one of my favorite dishes. The plate is extremely hot, and the richness of it all is tempered by the crispy bread, which does a good job complementing the Jamón, egg, and truffle butter. It’s an extremely rich dish, though, and, while two of us liked it, I think Simon mentioned that it was too rich and decadent for him. 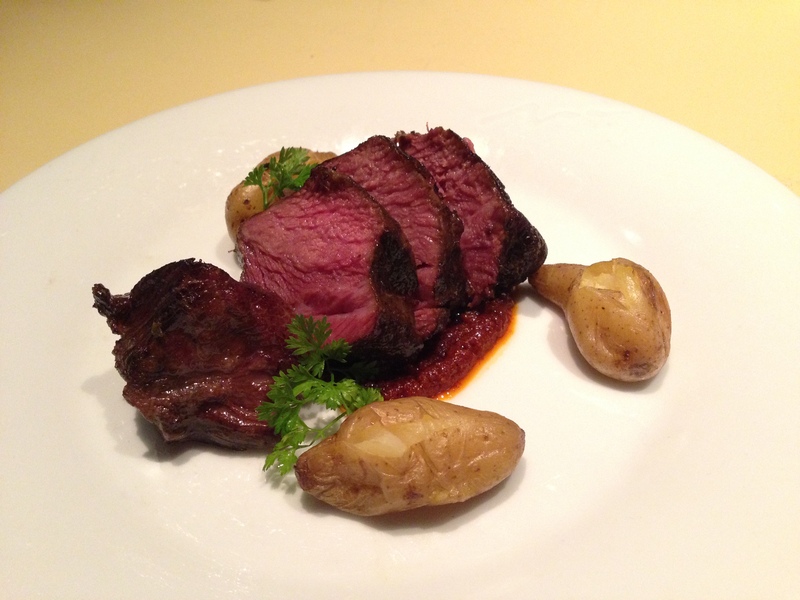 Braised Wagyu beef cheeks with mojo rojo sauce. Simon: One of the few that warranted a repeat from my previous visit (the others being the jamón, the jamón and egg, and the cheese steak. It pretty much melts in the mouth, and is decadently rich. Actually reminds me of 72hr short ribs in how rich and melt-in-mouth it is.